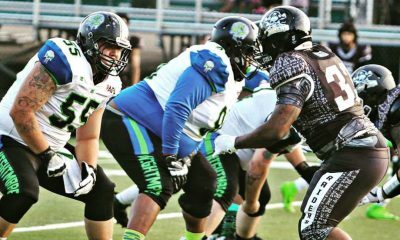 OBERLIN, Ohio – It was a blowout from start to finish tonight as the Lorain County Nightmares improved their record to 3-3 with a 33-6 dominant win over the visiting Pittsburgh Rangers. 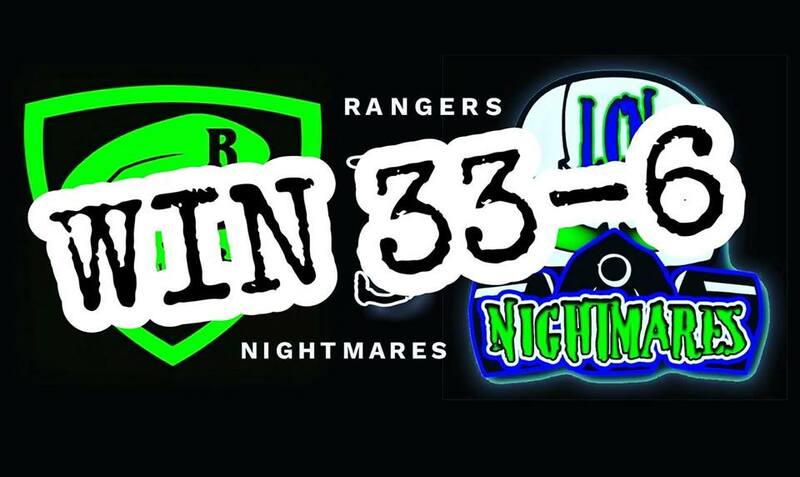 After a tight first half that saw the Nightmares build a 13-6 halftime lead, the Nightmares went off in the second half, outscoring the Rangers 20-0 to win with ease. The Nightmares came into tonight’s game without leading rusher Dontez Smith and needed others to step up and fill the void, several men certainly did. Aries Irby finished with 59 yards on the ground, including a pivotal fourth down conversion on the opening drive of the game for the Nightmares. 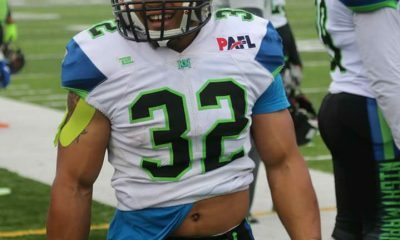 His counterpart in the backfield, David Mosby finished with 76 monster yards. 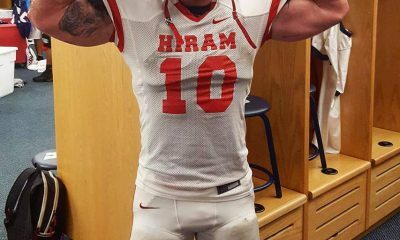 Most of the big damage from the nightmares was done through the air however, as Brandon DiMarco launched 4 touchdown passes, and even ran for one. DiMarco was efficient, finishing with 228 yards on 13 of 22 passing. It was another great second half for DiMarco, who has been a second half player all season. Two of his touchdown passes came in the second half, along with an amazing TD run that saw him put the game away as he got hit so hard, he flipped upside down, but held onto the ball for the score. The Nightmares forced the Rangers into a three and out to start the game. The Rangers then had to punt from the back of their end zone, which gave the ball to Nightmares on the opposing 25. Aries Irby would convert a crucial fourth and inches to keep the drive alive, a gutsy call by head coach Jamie Ray Adams that paid off. One play later it was DiMarco finding Rob Johnson in the corner of the end zone to start the scoring. A little later in the first quarter, it was DiMarco and the Nightmares striking again though the air. This time around it was the JCU graduate hitting a Howell on a 29-yard launch which would put Lorain County up 13-0 after one quarter of play. The Rangers would cut it to 13-6 with under a minute to go in the second quarter. The Nightmares were done messing around in the second half and went for blood early and often. The second half scoring spree saw two touchdown passes from DiMarco. One to Jimmy Wagner and then another long bomb to TJ Howell. The scoring also consisted of a DiMarco touchdown scramble off of a botched snap. Dimarco turned a near disaster into six points.